STURDY CONSTRUCTION - Organize your children's books, toys, small picture frames, and other decorative pieces with this Nursery Room Wall Shelf Set from Fast Home Goods. It is made with a sturdy, solid wood and has an understated yet functional design that is great for bedrooms, kitchens, and bathrooms. MULTIPURPOSE SHELF - Unleash your creativity with this wall shelf set. You can place it in your child's bedroom as a space-saving bookshelf or use it as a spice rack or condiment stand in the kitchen. You can also put it in the bathroom to store your shampoo, conditioner, face wash, body soap, toothpaste, toothbrush, and other toiletry essentials. COMES IN SET OF 2 - Fast Home Goods offers you a durable, smart, and functional wall shelf set. In addition, when you buy this product, you'll get two well-designed shelves! This nursery room wall shelf comes in a set of two to provide enough space for your books, toys, candles, and other small items at home. EASY TO INSTALL - This multipurpose shelf set is easy and simple for you to install on your own. You don't need to hire a professional carpenter to mount your shelves. Basic wall mounting screws and anchors are already included in this set. GREAT GIFT IDEA - This shelf looks amazing in any room, complementing your interior by displaying your books, photos, CDs, etc. Give this superb home décor piece to your friends and family members who love to keep everything organized. Add charm to any room by bringing home this attractive Nursery Room Wall Shelf Set from Fast Home Goods! This lovely shelf is made with sturdy, solid wood and comes in a beautiful, understated white. 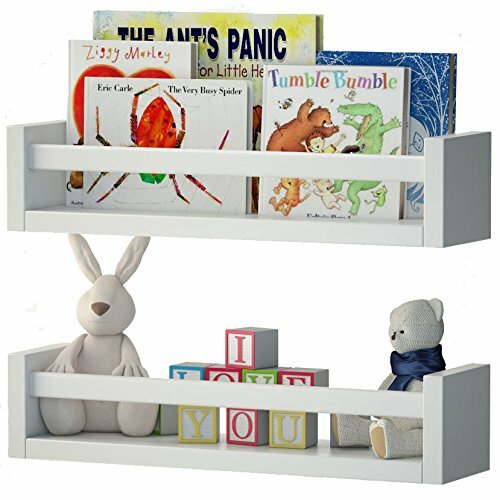 You can place books, toys, photos, and other small items on this Nursery Room Wall Shelf Set. Regardless of its name, this wood shelf can also be used in the bathroom to store your toiletry essentials such as body soap, shampoo, shaving cream, toilet paper rolls, etc. You can also use it as a spice rack or condiment stand in the kitchen. When you buy the Nursery Room Wall Shelf, furthermore, you'll receive not just one, but two impressive shelves! This product comes in a set of two in order to provide enough space for your books, toys, candles, and other collectibles that you want to store and display conveniently. Installing this versatile shelf is easy and simple. 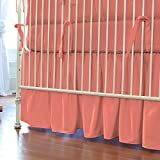 With the basic wall mounting screws and anchors that are already included in this set, you can install it on your own without needing to hire a professional carpenter.